If you love music, you begin to see life through a truly natural dimension. Your thoughts become wiser and your acts more meaningful. This is the belief held by Raghu Kunche, who ripped out a sensation with his debut song – Lachimi Lachimi in the film Bachi (2000) - as playback singer. These days, he is caught in the grip of Love. After clinching the deal with his private album Raghu With Love, he gets ready for release of his next – Love in New York, a video album on Love. With this, Raghu makes his debut as music director. This project made him don multiple responsibilities as a singer, producer, music director and director. With five lyrics, four in Telugu and one in English, the album is an exploration into the realms of Love, Love and only Love. These montage songs were shot in the backdrop of the snow-covered streets and parks of New York, this January. Plans are afoot to bring the album to the cozy circles of music lovers with penchant for love, in June. Apart from love, Raghu Kunche speaks about the worst groupism in the film industry, and warns against some of the commercial trends in the field of music. Excerpts from an exclusive interview with Idlebrain - . Tell us about your latest video album. What are the highlights? It is Love in New York (wallpapers here). I drew inspiration for this album from the deep layers of my own experiences. It is subjective. At the same time, it's a tribute to lovers all over the world. I conceived five stages in Love – from the time when the seed is sown till its growth. I am not bothered about its further growth or its later journey. By the time when you get confirmation that you are in love, you have crossed five stages. Love in New York is exactly that and ends with that – Never Knew, Dilemma, Castle in Air, Trance of Love and Mad in Love. Early in January I left for New York, with my mind engrossed with thoughts of filming a beautiful album on love. I thought of doing the album with myself singly, but later I involuntarily launched a search for a beautiful Telugu girl there to costar me. A good friend of mine (our Telugu man) asked me to have a look at an American girl, a student with NY Film Institute. The 22-year old Miss Manhattan, Elisha, stunned me with her 'you can't escape from me" features which I thought were an ultimate match for my inexpressible thoughts. That was the ultimate highlight of the video. When she perceived my concept of the album, a rare feeling of satisfaction traveled in me. The shoot was done at the breathtaking snow-clad locations in NJ, Atlanta, Manhattan, Bronx, Central Park and Brooklyn Bridge. I express my sincere thanks to Cinematographer Ashok Baddi and Editor Venkat Reddy (who did promos for thriller film Mantra) for their precious cooperation. I ardently wish to release the album in June. While shooting the songs, we never had any problems. The civic authorities out on the job of clearing the snow enjoyed watching our shoot. They wished us with love from their hearts. Here, my target group is between the age group of 15-30, who are vulnerable to the power of Love. What was the response you had for your previous album Raghu With Love? Professionally and personally, I found myself on Mt. Everest. My special thanks to the media, without whose support I would not have achieved such target levels. It was about Love for Oldies. I even got benefited financially. Why should I hide it? This gave me the first glimpses of promoting myself professionally. I understood that music loves would never betray the efforts of people like me, when the albums are really made with seriousness, with good quality. This alone helps carrying the message from heart to heart. Genuine discussion will ensue. You don't find much patronage to video albums or private songs in Andhra Pradesh. How confident are with your efforts? I agree with you. The culprit for such a disgusting scenario is lack of quality and ignorance of promotional strategies. Above all, the element of reckless handling of things pervades the field. If these disadvantages are overcome, we will be competing with Mumbai groups, to that matter the western giants, soon. Quality of frame, clarity of lyric and their relevance to your soul is what matters in video albums. You said that Love in New York is a subjective stuff. Tell us your experience of falling in love. (Looking at the sky) Moments of falling in love will haunt for a lifetime. I too was in love. Both understood each other's strengths and weaknesses. I was a jealous lover. I clearly knew that I was a misfit for that girl. She too had an ambition in life, which was more supreme than mine. Of course, the love didn't last long. At last, she gave me a big hand. (He laughs with the flash of recollection so strong in his eyes). Tell us about your college days. Did that period hold any platform for your career as a singer? What about awards? Thank you for making me nostalgic. Let me start with the school days. I was born at a beautiful village Gadarada in East Godavari district. The chirping of birds always fascinated me. I cherished a strong urge to sing. In college, I used to sing some small bits from hit songs. The burning zeal brought me to Hyderabad, where I took my BA (Music) from Telugu University. After hiccups, I started my career in Tollywood as a dubbing artiste, and further expanding it as a TV artiste and anchor. I got the first break when Puri Jagan, my roommate, gave me an opportunity with Lachimi Lachimi song in Bachi. I sang the hit songs in ANOTA, Desamuduru and Krishna. I got good recognition with Pandem Kodi, as I sang all the songs. So far, I sang more than 300 songs. It gives me sea of happiness to recall again and again. I sang my second song (Hungama Hungama) for Megastar Chiranjeevi for the film Mrigaraju. The megastar himself gave me the opportunity after listening to my Lachimi Lachimi song. I received the Nandi Award on four occasions, as a dubbing artiste, playback singer, best supporting actor and composer. Who is your inspiration in this field of (music)? Who else? It's AR Rehman. I call him Music God. He inspires me from dawn to dawn. 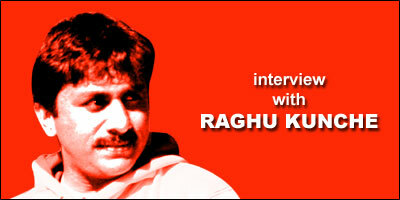 He released my first album (Raghu With Love) and it was one of the greatest moments in my life. Earlier, when I was anchor to a TV programme, Rehman was the judge for the same. Before tasting the music of Rehman, I was very much fascinated with Ramesh Naidu and RD Burman. In the years that followed, I became a devotee of Rehman. Do you have any iota of hope that you will work with Rehman? Yes. Hope is my strength. It drives me constantly. I know, I require more talent and need to be more standard in my workmanship to work with such a living legend. If God prevails on me, I will surely work with my God. How did you find the encouragement from your parents? The encouragement from my parents is beyond words of expression. My father (a modest farmer) and my mother (a village woman who is no more) stood by me always. My mother saw me receiving three Nandi Awards, but passed away by the time I got the fourth one. My mother used to give me immense moral support. She would say – We don't force anything on you. You are a free man. Make a way for yourself. To become an all-rounder like Kishore Kumar. I also cherish a genuine and humane dream. That is to become a music director on the big screen. I am confident that my work as musician for Love in New York will do the correct platform for my further career. My confidence level is such that I will surely be doing the sequel to it. If I were to click as music director, I want to introduce new singers (a male and female) for each of my film. Do you think it is so difficult for you? Not like that. I believe in myself. At the same time, I know that it is doubly important for a producer or director to believe me. I look forward to my patrons to be uncompromising when it comes to quality. You say AR Rehman is your God and you want to become an all-rounder like Kishore Kumar. Why don't you try for chances in Bollywood? It's a good question. I want to hold back nothing. Let me rip out my heart. Some of our music directors had made such attempts. They took it for granted that they would enact the southern magic in for the northern people. Did it work out? No. It was only AR Rehman, a legend from south, who mesmerized the world. I have learnt my lessons by observing him. If you want go global, you need to know the art of classifying a product and its application with the right feel, without disturbing the natural, cultural and traditional ambience of the region. For instance, take Lagaan. It has the backdrop of the British Raj in North India. Jodha Akbar has the historical backdrop in Rajasthan, with its deep-rooted royal customs and traditions. AR Rehman enlivened the atmosphere. So, simply dreaming of making waves in Bollywood without understanding the regional, cultural and traditional balances is like making a journey by foot in Thar Desert. What were the moments which pinned your heart? To be frank, some people really don't know about some people. Still they hate each other. All these egos and hatred is nonsense. Clean expression is lacking now. Do you have any complaints about things in film industry? Say, your music segment? Making complaints is my taboo. The situation is so hypocritical that even if you want to say the truth, your voice is made to choke for fear of repercussions. I can't compromise in the name of success. For a healthy trend to dawn here, you need to keep at bay – the elements of groupism, coterie, nepotism and casteism. Let the artiste live in absolute freedom. If anyone is free from such elements in the industry, he is a very lucky man. Just tell me one instance. Long back, I sang a song in a film. That was removed by the music director. The hero of the film personally liked it and prompted the music director to retain it in tact. From that day onwards, I never had the opportunity to work for him. It happened several years ago. Still, I meet him regularly, respect him with a clean heart and love to work with him. But, I know it will not happen. Practical thinking has become a rare thing. It has become a mystery for me to understand this. That's why I want to ask. Why such hatred without a proper reason? People like me are in multitudes. They all need justice. However, I am hopeful of a change. A good number of talented youngsters are coming with positive ideas in the industry, not only in the music field, but in all departments. Any suggestion to the music lovers? Yes. I want to give one important and never-to be-missed suggestion. I am not insisting on anyone to follow that. In the name of Talent Hunt, some programmes are being arranged for the children in the age group as low as 6 or 7. Prizes range from a Rs. 2 Crore apartment to lakhs of rupees. This is very dangerous. At that very tender age, they can't digest defeat. At the same time, they can't enjoy the success. This will have a very bad and unhealthy impact on their minds. Parents should understand this. There are umpteen numbers of instances when parents quarreled with the judges at the competitions when their children fail to get through the show. Such things will altogether murder the spirit of sportiveness among the children. I repeatedly request one and all to take note of this. I want to bring video albums on Lord Shiva and Lord Jesus.